↑ Acause the Armenie Hielands isna a well-defined aurie, soorces vary greatly on whaur Aragats ranks. Some soorces cry it the seicont heichest (efter Moont Ararat in Turkey), ithers the third heichest (efter Ararat an Süphan, an aa in Turkey) an some the fowert heichest (efter Ararat, Sabalan in Iran, an Süphan). ↑ 1.0 1.1 1.2 "Aragats". Global Volcanism Program. Smithsonian Institution. ↑ "High prominence mountains in Caucasus and Russia outside of Europe". ii.uib.no. Institutt for informatikk University of Bergen. ↑ "Արագած". armgeo.am (in Armenie). Armenian Geographic. 27 May 2015. ↑ Aslani︠a︡n, A. T. (1973). "Yerevan-Southern Summit of Aragats Volcano". Guide-book of Excursions of the All-union Conference for the Study of the Quaternary Period: Armenian SSR. Academy of Sciences of the Armenian SSR Institute of Geological Sciences. p. 72. By its height among the highest peaks of the Armenian highland Aragats gives way only to Ararat — the famous biblical mountain that rises for more than 1 km. ↑ Hewsen, Robert H.; Anania Shirakatsi (1992). The Geography of Ananias of Širak: Ašxarhacʻoycʻ, the Long and the Short Recensions. Reichert. p. 217. ISBN 9783882264852. 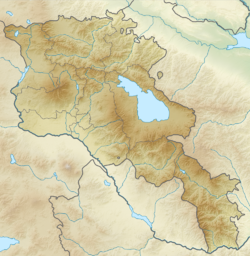 The highest peak in the Armenian SSR, Aragac is the third highest mountain on the Armenian plateau after Ararat (16,916 ft. /5172 m), and Sip'an (Subhan, 14,543/4434). ↑ Smith, Adam T. (2009). "Regional Investigations in the Tsaghkahovit Plain: Orientation and Methodology". The Foundations of Research and Regional Survey in the Tsaghkahovit Plain, Armenia. Oriental Institute of the University of Chicago. p. 95. ISBN 9781885923622. Aragats is the third highest peak in the Armenian Highland after Great Ararat (5,165 m a.s.l.) and Süphan Dağı (4,434 m a.s.l.). ↑ Nazarian, Kh. (1974). "Արագած (Aragats)". Soviet Armenian Encyclopedia Volume I (in Armenie). p. 677–678.